Jane Perrone over at Horticultural shared the news that she can't remember ever having baked bread! So to encourage all bread virgins to have a go (even if there's a baker in the house already) here's a recipe I first read as Doris Grant's Loaf in Garden Organic's Organic Way magazine. It's a sure-fire one to get you started, there's no kneading and you'll get a dense and satisfying loaf every time. 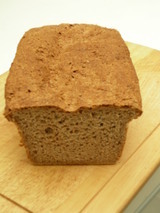 You'll need two pounds of wholemeal flour. I use flour ground by Lurgashall Mill at the Weald and Downland Open Air Museum near Chichester. Add a pinch of salt to the flour. Measure two teaspoons of dried yeast into a glass and add an inch or two of luke warm water, a pinch of sugar, stir and let it froth up - about five minutes. Add to the bowl, mix with flour and then gradually mix in about a pint of warm water. You may use a tad more or less but keep mixing until the dough leaves the side of the bowl - its a fairly wet dough. Form it into a ball and with a sharp knife cut in half if using two, one pound, loaf tins. Press the dough down to shape and fill them and let stand, covered with a towel, until the bread rises just above the top of the tin but not over it, if you don't want a loaf with 'muffin tops' like in the picture! Bake in a pre-heated oven at 200C/400F for 40 - 45 minutes. Remove to cool on a rack. Goes well with most things and is delicious lightly toasted and topped with thick cut ham and a generous spread of Dijon mustard. To my tongue its hard to beat a bowl of stewed rhubarb - no sugar added - for that tarty mouth puckering tang. This is where freezing comes into its own. Harvested in summer and chunked, bagged and frozen in portion sizes, I'll be enjoying it stewed, hot or cold, with some yoghurt all winter. And its so easy - out with the bag, empty into the saucepan, low heat, a table spoon of water just to moisten the pan as the rhubarb will shed a lot and stew gently from frozen. If you want something sweeter add sugar or bake a pie with rhubarb and strawberry (not exactly seasonal but maybe you baked it in summer). It's a slightly odd combination but the sweet/sour mix really does work. I've three varieties on the allotment. Timberley Early is now tiring so I'll divide the crown and replant it. Victoria produced fat, tasty stalks all summer. Champagne was planted this season and left to settle in before I'll lightly pick from it next summer. Other than tidying up the leaves in winter (I just scoop the debris over the crown - is this the right thing to do?) and treating each plant to a few bucketfuls of manure, it just grows. Spoons crossed it continues to do so! Some of the mountain (or should that be lake) of apple and blackberry summer pudding mix in the freezer got used up recently in a very simple pudding; basically a Yorkshire pudding batter with a twist. Combine four tablespoons of flour with one large egg, two tablespoons of sugar, slowly adding just under a cup of milk and beat to a thin batter. Add eight ounces of apple and blackberry (I've used chopped plums in the past; you may have raspberries, you could try raisins, prunes...just experiment) and stir in. Pour the batter mix into a greased loaf tin or ovenproof dish and bake for about 30-40 mins at 180 C. If it's still a bit watery give it some more time. Allow to cool a little; in fact this is lovely next day for breakfast! 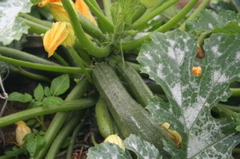 The courgettes are finally over, their leaves grey and moldy. But if you have any surplus here's a star receipe courtesy of Veg Box Diary. Very much a 'what you have to hand' recipe, you can experiment with the proportions - I use more courgette, going heavy on the garlic and light on the anchovy. Here's one version. Grate a whole courgette. Over a low flame add oil to the pan and melt several anchovy fillets and a couple of cloves of mashed garlic. Add the courgettes and cook until a soft mush. Add to pasta, add lots of parmesan, more olive oil if you like and enjoy. Reading Kim's recipe for herbed butter got me to thinking of laying down some parsley pesto sauce for the winter. I gave my Italian Loose Leaf Parsley its end of summer hair cut and set to making the sauce. It's dead easy. Pulse the parsley, stems and all to give a fuller parsley taste, in a food processor, adding olive oil as you do, continuing to add oil until the mass has the consistency of runny honey. Spoon the contents into flexible ice cube trays (it makes getting them out later so much easier) bag and freeze. When you come to use it defrost as many cubes you need, each one being about a tablespoon, and then add chopped garlic. I've found freezing the sauce with garlic doesn't work - the enzymes in the garlic react so it tastes hot, even rancid. Its vivid colour and fresh taste is an excellent addition to soups, good on its own as a pasta sauce, and a great a dressing for bland white fish with lashings of finely chopped garlic. Turn your back on the alloment for a week and delicate courgettes become monster marrows. Courgette and basil soup is the answer to the glut. A real taste of summer, it freezes well too. In the same pot that you will use for the soup, gently soften a medium onion, roughly chopped, adding a dash of olive oil. Slice three pounds of courgettes into one inch chunks, skin and all, stir in with the onions for a few minutes. Add three pints of water - you can add more later if you want a thinner soup as courgettes have a lot of water in them - bringing to just below a boil. Turn down and simmer for fifteen minutes. Add a generous handful of basil leaves and liquidise the soup once it has cooled. Reheat to serve, garnish with chopped parsley, cream or yoghurt if you wish. Quick, easy, vibrantly coloured and delicious.